Radiation dose is a measure of the amount of exposure to radiation. There are three kinds of dose in radiological protection. Absorbed dose is a measureable, physical quantity, while equivalent dose and effective dose are specifically for radiological protection purposes. Effective dose in particular is a central feature of radiological protection. It sums up any number of different exposures into a single number that reflects, in a general way, the overall risk. The concept may be complex, but it makes radiological protection practical to implement. Absorbed dose is the amount of energy deposited by radiation in a mass. The mass can be anything: water, rock, air, people, etc. Absorbed dose is expressed in milligrays (mGy). Equivalent dose is calculated for individual organs. It is based on the absorbed dose to an organ, adjusted to account for the effectiveness of the type of radiation. Equivalent dose is expressed in millisieverts (mSv) to an organ. Effective dose is calculated for the whole body. It is sometimes called whole-body dose. It is the addition of equivalent doses to all organs, each adjusted to account for the sensitivity of the organ to radiation. Effective dose is expressed in millisieverts (mSv). Absorbed dose is a measurable, physical quantity. It is expressed in grays (Gy), or, more frequently milligrays (mGy), which are 1/1000th of a gray. 1 gray = 1 joule of energy deposited in 1 kilogram of material i.e. 1 Gy = 1 J/kg. Equivalent dose = absorbed Dose multiplied the appropriate radiation weighting factor. 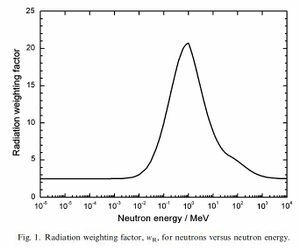 The radiation weighting factors are needed because different types of radiation (like alpha, beta, gamma, and neutrons) can have different effects even if the absorbed dose is the same. Equivalent dose is expressed in sieverts (Sv), or, more frequently, millisieverts (mSv) which are 1/1000th of a sievert, and the organ should always be specified (for example "25 mSv to the skin"). In the simplest cases, for gamma (photon) and beta (electron) radiation, the radiation weighting factor is 1, and therefore, for example, an absorbed dose of 1 mGy in an organ equals an equivalent dose of 1 mSv to that organ. 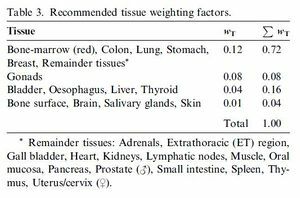 The tissue weighting factors are needed because different organs have different levels of sensitivity to radiation, even if the equivalent dose is the same. Effective dose is expressed in sieverts (Sv), or, more frequently, millisieverts (mSv) which are 1/1000th of a sievert. This is the most frequently used dose in radiological protection. Unless you see mention of a specific organ, a "dose" in Sv or mSv is the effective dose. In the simplest cases, for uniform whole-body exposure to gamma (photon) or beta (electron) radiation, the radiation weighting factor is 1, and the tissue weighting factors add up to 1, and therefore, for example, an absorbed dose of 1 mGy equals an effective dose of 1 mSv. The SI unit of absorbed dose is J kg-1 and its special name is gray (Gy) ... While it is defined at any point in matter, its value is obtained as an average over a mass ... Absorbed dose is a measurable quantity and primary standards exist to determine its value. When using the quantity absorbed dose in practical protection applications, doses are averaged over tissue volumes. It is assumed that, for low doses, the mean value of absorbed dose averaged over a specific organ or tissue can be correlated with radiation detriment for stochastic effects in that tissue with an accuracy sufficient for the purposes of radiological protection. 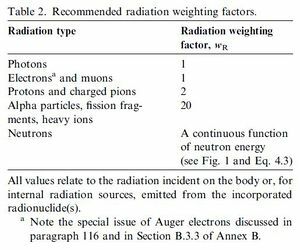 where wR is the radiation weighting factor for radiation R. The sum is performed over all types of radiations involved. The unit of equivalent dose is J kg-1 and has the special name sievert (Sv). ... The development of ... effective dose has made a significant contribution to radiological protection as it has enabled doses to be summed from whole and partial body exposure from external radiation of various types and from intakes of radionuclides. where wT is the tissue weighting factor for tissue T and ΣwT = 1. The sum is performed over all organs and tissues of the human body considered to be sensitive to the induction of stochastic effects. These wT values are chosen to represent the contributions of individual organs and tissues to overall radiation detriment from stochastic effects. The unit of effective dose is J kg-1 with the special name sievert (Sv). The unit is the same for equivalent dose and effective dose ... Care must be taken to ensure that the quantity being used is clearly stated. This page was last edited on 8 March 2019, at 20:54.